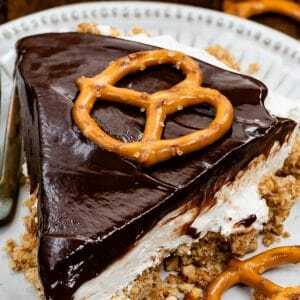 This No Bake Cheesecake is a chocolate covered pretzel pie! 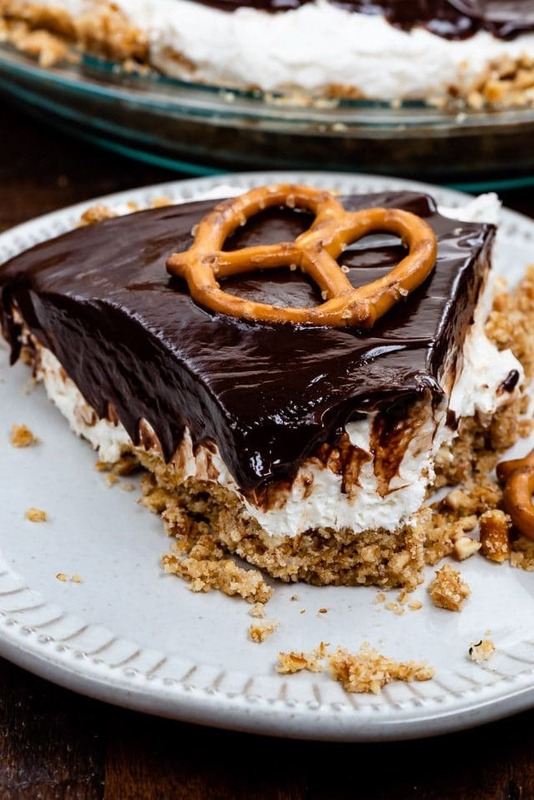 It’s a pretzel crust filled with no-bake cheesecake and topped with chocolate ganache. 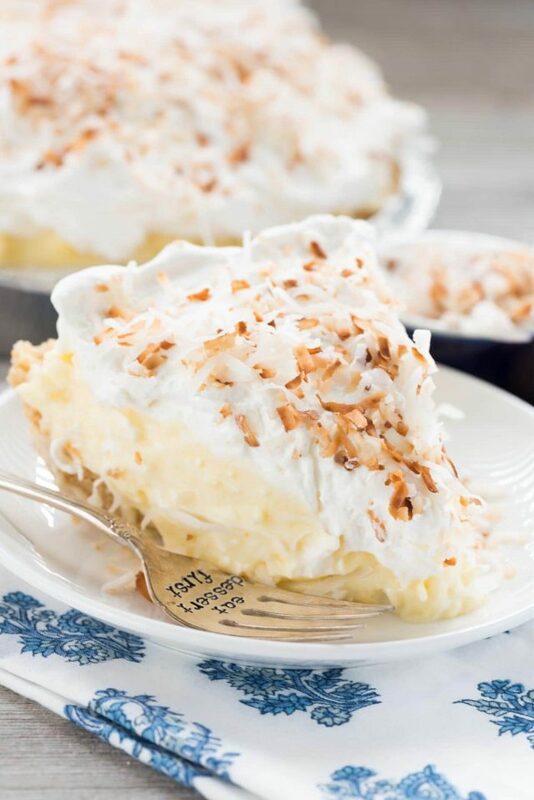 This sweet and salty pie recipe is so good! No bake cheesecake recipes are one of my favorite spring and summer desserts. This pie is reminiscent of my Strawberry Salad Pie and my No-bake Lemon Cheesecake. Any of them are perfect for these warmer months. And so on. It took me probably a good week to settle down to write this and come up with a name: Chocolate Covered Pretzel No Bake Cheesecake. I feel like that covers all the bases: a no-bake cheesecake filling with a pretzel crust and it’s chocolate covered with ganache. In other words: it’s heaven. I’ve made a lot of no-bake cheesecakes but I have to say, this is my favorite filling recipe for a no bake cheesecake. It’s simple, fast, and foolproof and will set up every time, I promise. Plus, you probably have some of the ingredients already. I also love pairing no-bake cheesecake with a no-bake crust. What’s the point of making a no-bake pie if you have to turn on the oven to bake the crust? The sweetness of the cheesecake pairs so well with the salty pretzels and the rich chocolate ganache on top completes the entire thing. After all, chocolate covered pretzels are crack in a bag, at least for me, so a chocolate covered pretzel PIE? Um, yes. 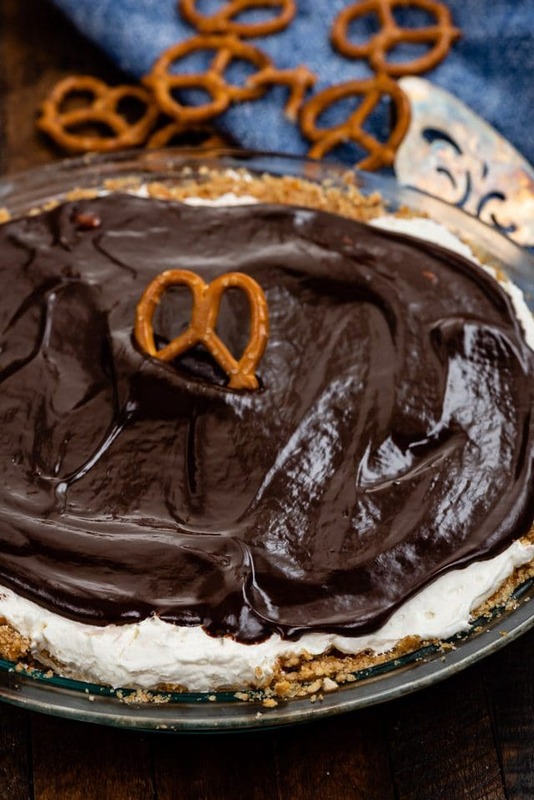 Basically, if you love chocolate covered pretzels and no-bake cheesecake, you’re going to love this pie! At some point I’ll post about how to make a pretzel pie crust, but in the meantime I’ll explain it here. It’s simple to do and you just need a few ingredients. A pretzel crust is like a graham cracker crust but with pretzels instead of graham crumbs. To make a pretzel pie crust you just need crunchy pretzels, sugar, and melted butter. It’s a common problem; pretzel crusts often fall apart easier than, say, graham cracker crust or Oreo crust. That’s because it’s hard to get pretzels to be super fine unless you’re using a food processor. You can see from the photos that my crust was a bit crumbly, but it mostly holds together thanks to the melted butter and the fact that I packed the crust tight. To ensure your pretzel crust holds together use a food processor to crush your pretzels to a fine crumb. Once you have your crust, then it’s time to make a simple no-bake cheesecake filling. This no bake cheesecake recipe holds together and is never runny. It also just has FOUR simple ingredients: cream cheese, sugar, vanilla extract, and Cool Whip. I know lots of people hate cool whip but I have to say, if you’re making a no-bake cheesecake it’s a must. It’s so much more stabile then whipped cream! 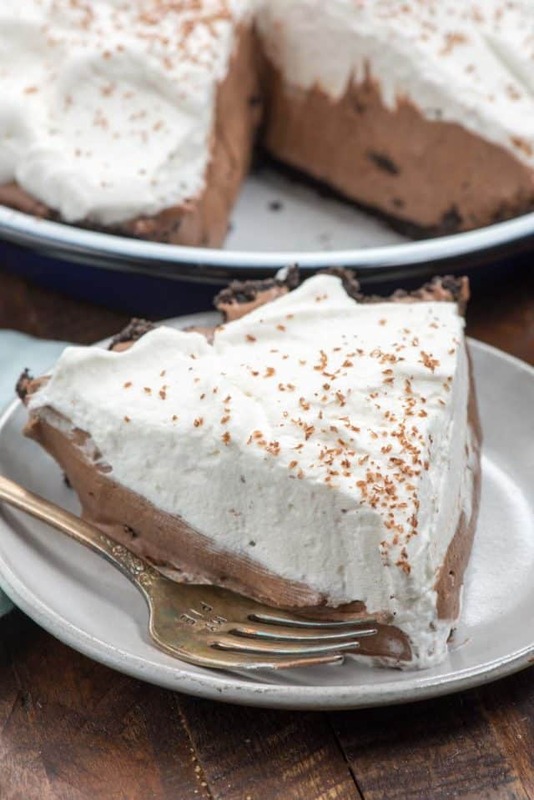 The no bake cheesecake filling in this pie is super fluffy and foolproof! Simply heat heavy whipping cream and chocolate chips, whisk, then let cool. Voila: ganache! The thickness of your ganache depends on your ratio of heavy whipping cream to chocolate chips. For this recipe I use a 1:2 ratio (1/2 cup of heavy whipping cream to 1 cup of chocolate chips). It’ll be thin when you start and thicken as it cools. A chocolate covered pretzel no bake cheesecake is the perfect spring and summer dessert: it’s salty and sweet and easy to make without your oven. How do you store this pie? Because it has cream cheese and cool whip in it, loosely cover it and store it in the refrigerator. Before serving, I’d let it come to room temperature for at least 30 minutes. Be sure to use unsalted butter for your crust. The pretzels are quite salty and using salted butter might put it over the top. Use a food processor to crush your pretzels for a firmer pretzel crust. Let your cream cheese come to room temperature before making the filling to avoid lumps. Use any flavor chocolate chip to make the ganache (milk or semi-sweet). You can make this up to a day ahead of time. 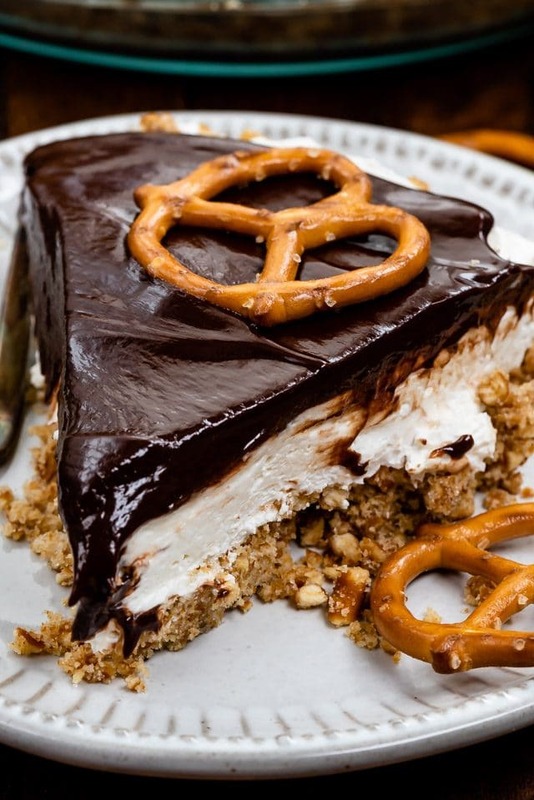 This No Bake Cheesecake is a chocolate covered pretzel pie! It's a pretzel crust filled with no-bake cheesecake and topped with chocolate ganache. This sweet and salty pie recipe is so good! Make the filling: Beat cream cheese, sugar, and vanilla until smooth. Whisk or fold in whipped topping until no lumps remain. Spread in prepared crust. Chill for at least 4 hours before serving. Make the topping: add chocolate chips and heavy whipping cream to a microwave safe bowl or measuring cup. Heat 1 minute then whisk until smooth. Let sit until cool and thick. When ready to serve top the pie with the cooled ganache. If the ganache gets too thick to spread, just heat it a few seconds in the microwave to thin. A dream for a chocolate lover!